Photo courtesy of Jeff Owen The 2019 prom court at Troy High School includes, front row, left to right: Tiyanna Boyd, Lily Clouser, Josalyn Abrams, Megan Malott, Mackenzie Evans, Lauren Garlow, Emilie Farrier, Ciena Miller, Olivia Love, Josie Rohlfs, Katie Castaneda; back row, left to right: Chris DeMeo, Travis Bertram, Spence Klopfenstein, Jacob Adams, Cole Brogan, Jakob Libecap, Sam Shaneyfelt, Luke Severt, Sam Felton, Bailey Webb, Seth Plantz. The THS prom will be held from 8-11 p.m. Saturday, April 13, at the Dayton Art Institute. The 2019 prom court at Troy High School includes, front row, left to right: Tiyanna Boyd, Lily Clouser, Josalyn Abrams, Megan Malott, Mackenzie Evans, Lauren Garlow, Emilie Farrier, Ciena Miller, Olivia Love, Josie Rohlfs, Katie Castaneda; back row, left to right: Chris DeMeo, Travis Bertram, Spence Klopfenstein, Jacob Adams, Cole Brogan, Jakob Libecap, Sam Shaneyfelt, Luke Severt, Sam Felton, Bailey Webb, Seth Plantz. The THS prom will be held from 8-11 p.m. Saturday, April 13, at the Dayton Art Institute. 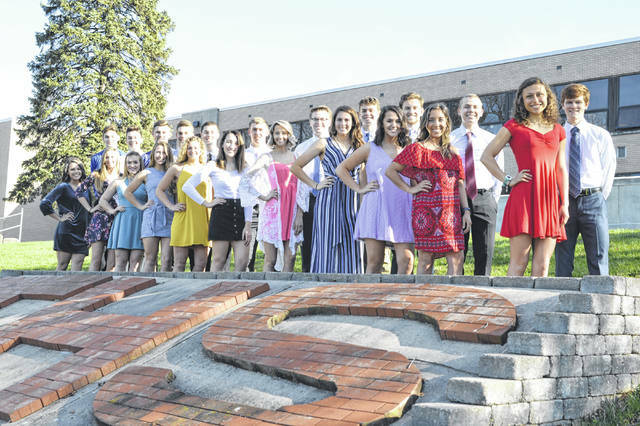 https://www.tdn-net.com/wp-content/uploads/sites/21/2019/04/web1_2019-Prom-Court-Photo.jpgPhoto courtesy of Jeff Owen The 2019 prom court at Troy High School includes, front row, left to right: Tiyanna Boyd, Lily Clouser, Josalyn Abrams, Megan Malott, Mackenzie Evans, Lauren Garlow, Emilie Farrier, Ciena Miller, Olivia Love, Josie Rohlfs, Katie Castaneda; back row, left to right: Chris DeMeo, Travis Bertram, Spence Klopfenstein, Jacob Adams, Cole Brogan, Jakob Libecap, Sam Shaneyfelt, Luke Severt, Sam Felton, Bailey Webb, Seth Plantz. The THS prom will be held from 8-11 p.m. Saturday, April 13, at the Dayton Art Institute.